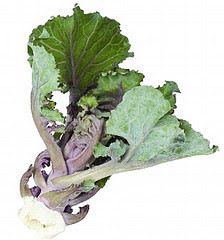 365 Days of Kale: Something new under the sun: "Flower-Sprout"
Something new under the sun: "Flower-Sprout"
London's Marks & Spencer will begin marketing a new vegetable this week called the Flower-sprout, a cross between the Brussels sprout and kale. Ten years in the making by plant breeders patiently crossing, growing, and testing the results of crossing those two vegetables, the "Flower-sprout" is certainly beautiful. I don't know if this new vegetable and/or the seeds will be available to purchase here in the US, but if anyone reading this post is in the UK and has a chance to eat this new Brassica vegetable, please let us know how it tasted and how you used it! That certainly is pretty and would be fun to try to grow!